Churches please use these resources to inspire and compliment the good work you do in service to your congregations as alumni and friends of Eden. Check back for new resources. 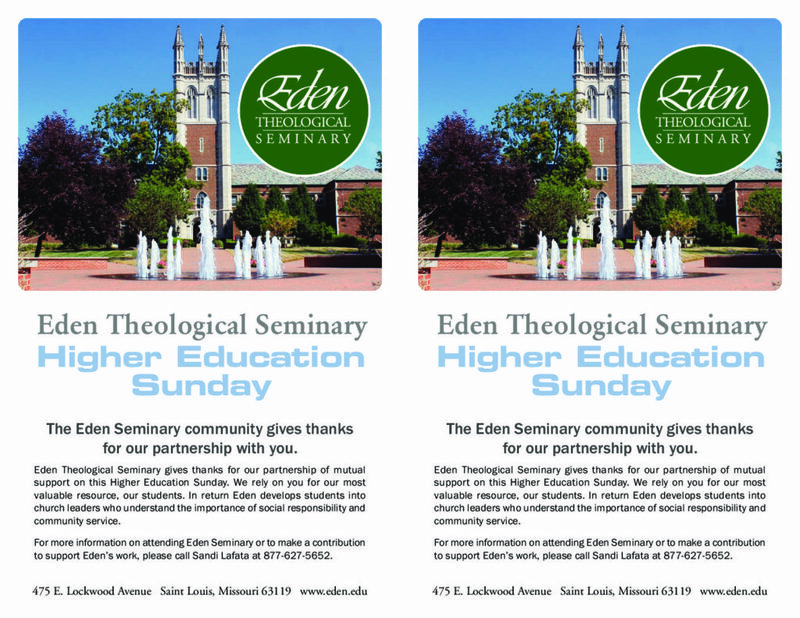 Eden bulletins and Seminary Sunday and Higher Education Sunday logos are available for download on this page. 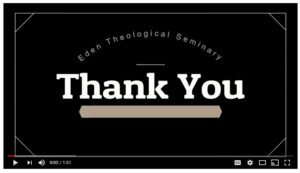 Click the picture above to play our Eden Thank You video for Seminary Sunday. You may also use this following link to stream and play at your church: https://youtu.be/DhbF3Pd13Tk. 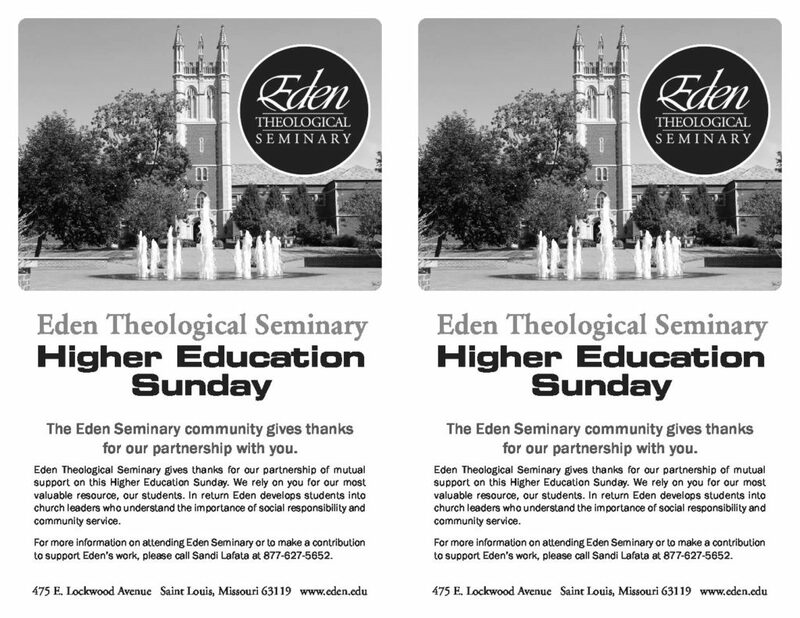 Click the picture above to play our Eden Thank You video for Higher Education Sunday. You may also use this following link to stream and play at your church: https://youtu.be/aObPnatieB4. Both .png and .jpg file types available below. The United Church of Christ’s seven seminaries, which we honor on Seminary Sunday, educate a new generation of ministers—deepening faith, exploring ancient wisdom in new contexts, and preparing for pastoral leadership. These seminaries have faculties that love the church. They do not simply pass on ideas, but engage students in deep reflection that will help them serve the church. Eden Theological Seminary in St. Louis is one of these schools. Our students read many of the same texts read by those preparing for the ministry in 1650—but they read and do so much more. Not only do they read the Bible and philosophy, but they also “read” cultural contexts; they deepen their faith not cloistered in a quiet library, but in lively classroom discussion, online blogs, creative chapel worship, with the church in foreign countries, and in community service. The church leaders of 1650 worried that the next generation might not have learned ministry. With its seminaries, the United Church of Christ need not worry about an educated clergy in the next generation. Today’s worry is different. We must worry whether there will be a learned laity. Will the women and men in our congregations have opportunities to deepen their faith, using it to understand better themselves and the world? Or will the absence of such opportunities make our members susceptible to the seductive belief that a return to “the old time religion” will make the world’s complex and troubled aspects go away? What are needed today are Christian women and men with a level of faith understanding that at least matches the level of sophistication they demonstrate every day in their work lives. 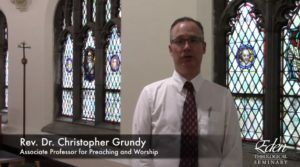 At Eden Seminary we are not only committed to educating the next generation of pastors. We are also committed to engaging a new generation of lay women and men—the people in the pew. We look forward to increasing the opportunities for lay people to explore Christian faith for life in the complex contemporary world. And then all of us can share that abundance with the world.